Team Bikeaholics members ForeignAffairsAdvisorThomas, Tom (aka TeamWrench) Lawrence and TeamCaptainLisa'sSonArik, accompanied by adjunct members Arik'sDadMikeSchoessow and Tom'sGirlfriendMarti joined TeamCaptainLisa in Santa Cruz for the opening season concert for the Santa Cruz County Symphony on October 5, 2003. 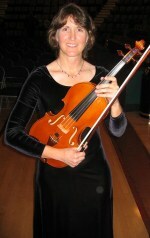 TeamCaptainLisa, who doubles, or sometimes triples as a professional violist, had been diligently working all week on her technique of "just in time practicing" on such tunes as Tchaikovsky's 4th Symphony, the 2nd Liszt Piano Concerto, and the Dances from Gloriana (for the coronation of Queen Elizabeth II) by Brittan. By 8:00 pm, TeamCaptainLisa had peaked in her training, and was ready for the main event. Upon sitting in her appointed chair in the viola section, TeamCaptainLisa looked for fellow TeamBikeaholics members, and signaled recognition by waving her bow. She was able to make contact with TandemTomMarti, then located StokerArik and DadMike. After a few minutes, the ForeignAffairsAdvisor was located, but not acknowledged until half-time. The event started with ConductorGranger giving a 15 minute monologue to stall the concert until the Santa Cruz Fireworks were over. We then warmed up with the Dances from Gloriana. At the first Controle, the piano was rolled onto the stage and the orchestra was retuned. The next stage included the Liszt Piano Concerto followed by the Chopin Nocturne as an encore. During Half-time, TeamBikeaholics members congregated at the next Controle near the cello section, and waited patiently until the ViolaCelebrityLisaa showed up. We talked about how great the first half went, and that the Santa Cruz Symphony was leading 2-1. Arik asked for money and was given $10 to quiet him and send him off to the Snack_Bar. After several minutes of kibbutzing, TeamCaptainLisa excused herself to go back to the Musician's Rest Stop to retrieve her viola. The second half went well, with the fiery first movement of the Tchaikovsky followed by a short retuning session. We continued with the beautiful "Andante", which included a heart rendering viola sectional solo on the main theme. The third movement was a "bows down" event, and TeamCaptainLisa utilized the calluses developed on the right index finger from years of "indexed shifting" to make it through the "all pizzicato" piece. Without further adieu, we exploded with a cymbal crash into the Finale. With lightning speed, the string and wind players whipped through the four pages. If Violists could be paid by the notes, we'd all be millionaires after this piece. The last Controle was located near the percussion section on the left side of the stage where PhotographerTom had relocated. He took several cameo shots of TeamCaptainLisa with her French viola, Micheline. We finished the event at round 10:30 pm. TeamCaptainLisa thanked fellow Bikeaholics for their "Audax-style" listening (we were all in the same auditorium for the entire event).